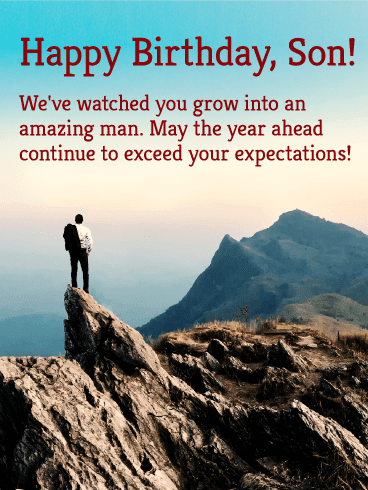 Happy Birthday, Son: Need some good Birthday wishes to send to your son, Here we have a collection of Beautiful Birthday messages which can be helpful to you. You can Share these Birthday wishes with your son via Text/SMS, email, Facebook, Whatsapp, IM, etc. There is no limit to how much I love you, and I plan on spending the rest of my days showering you with love and attention. May your birthday be filled with fondness and fun this year.. Thanks for giving me the opportunity to feel such an all-encompassing love. You fill my days with warmth, wonder, and joy. I hope your birthday is filled with the same.. If your birthday is only half as great as you, it will be the greatest celebration of the year. No one deserves it more than you. May your special day be filled with tons of cake and presents.. Nothing has been the same since you came into my life, and I want you to know I wouldn’t have it any other way. I am so grateful that you have changed my life for the better.. When you were little, I vowed always to protect, care for, and love you. Somehow over the years, our positions have been reversed. Now you protect and care for me, but I will still always love you.. Happy birthday to the little boy who stole my heart. I wish I could slow down time and keep you with me forever. Since I can’t do that, I will just have to settle for cherishing every moment spent with you. Happy birthday!. Happy birthday, dearest son. I hope this day will give you the inspiration and strength needed to transform everything negative that rears its head in your life into something positive. May this day inspire you to give life your best shot..
You have grown in the blink of an eye, my son. Not only in height but in maturity as well. Happy birthday to my taller, wiser, infinitely more lovable son!. You have such a rare gift in life: you make it so easy to love you. Happy birthday to my mischievous, darling, and absolutely adorable son. May you be healthy and happy on your special day.. I hope you always head in the direction of success, my son, and whether it be in life or love, I hope that all your dreams and ambitions come true. Happy birthday!. If you need a shoulder to lean on or a place to rest your burdens know that you can always turn to me. The job of being a parent will always include providing you with a place to call home.. I didn’t forget your birthday this year thanks to my good friend called Facebook. Have a wonderful day.. Whenever you are having hard times and feeling down just think of the love of your parents because regardless of your struggles in life we will always have your back.. I am so fortunate to have a son as fantastic as you. One who embodies honesty, strength, and greatness. I hope you have an incredible birthday filled with lots of wonderful surprises..
No matter what direction you take in life, I will always send you the best of wishes. I hope that this year your birthday is filled with everything you could possibly want. Happy birthday, son!. I look back with so much fondness and joy on all the time I’ve been blessed with you in my life. I can only hope that when you’re older, you’ll do the same. Happy birthday to my precious son!. I hope you are half as proud to be my son as I am to be your parent. Know that I am your biggest fan and your greatest protector in life. Happy birthday!. You turned my life around the moment you arrived into it. I can’t wait for another incredible year with you. Happy birthday to my lovely son.. Here is to success and fruitfulness in life. A true star was born today. Never stop shining : Happy birthday..
Never lose faith in yourself, son, because you are a star that is destined to shine until the end of time. I believe in you. Happy birthday.. Since the day you were born you have brought nothing but meaning and joy into my life. You are a fantastic son, and I feel so fortunate to be your parent. Happy birthday!. There are only few of your kind in this universe. You make motherhood such a blessing. Happy birthday to my most priceless blessing, you my son..
Every single day since the day you came into my life you’ve done nothing but amaze me. I’m so glad that I have a son who is not only charming but perfection as well.. The joy and happiness surrounding my life is all because of one person, my son. Happy birthday, my angel.. Always remember that whenever life gets too difficult for you that you can still turn to your parents. Hugs and advice will always be free from us. They might be the only things that are!. Know that when I scold you, it’s only because I care, and when I hug you, it’s always because I love you to pieces. I wish for only the best in life for you, and may your birthday be filled with lots of presents and laughter..
As you celebrate your new age, we want to thank you for making our lives colorful. Happy birthday!. Happy Birthday, Son! | Inspirational Birthday Messages For Him. Sons like you make parenthood an honorable calling. To us, you are a treasure that can never be bought with all the wealth in the universe. Happy birthday..
On your Big Day, son, it is my wish that you grow taller and wiser than me. Have a terrific birthday..
You give me so many reasons to be proud of you: you’re smart, funny, and courageous. May your birthday be filled with every delight you could possibly imagine this year..
Because of you, we are the best parents in the world. Here is to a year of more happiness in our lives. Happy birthday, son.. I promise to do everything possible to make your birthday a happy one because that is what you did with your very first cry. Happy birthday!. As you welcome another chapter of your life, I hope you embrace it with passion and determination. A son as marvelous as you definitely has great things ahead.. Whenever I need a reason to smile, I just think of you because you make everything in my life more beautiful. May your special day be truly extravagant. Happy birthday, son!. Your love is like a candle that will forever glow in my heart. You have brought nothing but light and joy into my life, and I can only hope that over the years I can be there for you like you have been there for me.. Son, on your birthday, I want you to know that you can reach mesmerizing heights if you give life your best shot. You are a truly outstanding son who never stops leaving me amazed. Have a great day!. When you were little, I used to be your hero, but now you’ve become mine. I can’t believe how much you’ve grown in the last few years. You’ve become an intelligent, strong, and brave young man whom I look up to..
My heart has been so full of love and joy ever since you were born that sometimes I think it will burst. It’s hard to contain all the feelings I have for you son, and on your birthday I hope you feel even a margin of how much I love you.. Nothing can compare to the love I have for you. Everyday should be a special day for a son as priceless as you. I will love you till the day that I die. Happy birthday.. Your love always brings a smile to my face and glee to my soul. May your birthday be just as special as you are, my son. Happy birthday!. This year for your birthday it seems our roles are reversed. Instead of giving you a present it seems you have gifted us with one, the gift of a perfect son. Happy birthday!. I hope your birthday marks the beginning of an incredible period of your life. Know that I couldn’t be more proud of the amazing gentleman you’ve become. Happy birthday, son!. You have always wanted us to treat you as an adult, so this birthday we decided to grant your wish. The cleaning and chores are all yours this year. You’re welcome!. Now that you are demanding not to be treated like a toddler, I hope you know the responsibilities of adults around the house. Happy birthday..
May your birthday herald great successes for the rest of your life. I want you to know that you are my biggest joy and greatest pride. Happy birthday, son!. When you were young, I tried to teach you everything, but now that you’re older you seem to think you know it all already! I love you anyway. Happy birthday, son!. You are a shining example of all that is bright and good in my world. I’m not sure what I did in life to deserve a son as marvelous as you, but I’m grateful for whatever it was..
You're wonder, and perfect and magical. Kind of like chocolate cake. Happy birthday to my son!. This year on your birthday I am so grateful that you’ve grown into such a bright and capable young man. It is such a comfort to know that whatever life throws your way you will always be able to handle it.. I have such sweet memories of you as a child, but I have faith that your future will hold even sweeter ones. I hope your cake is half as sweet as you are. Happy birthday, son!. The most beautiful part of our union is having an angel who brings light into our world. Happy birthday, handsome..
Our relationship may not have always been the smoothest one, but it’s always contained love and respect so we will get there in the end. Happy birthday to my son who tries my nerves but always earns my respect.. Thank you for being a constant reminder of how beautiful life is. You are the reason I smile every day. Happy birthday to my handsome son..
Good things come to people who wait. However, extraordinary things come to people who chase after what they want. Happy anniversary.. When I think of you, the first thing that comes to mind is the immense love and pride I have for you. It knows no bounds and has no equal. You are everything to me, my son.. If I look back at everything I’ve done in life, you’re easily the best thing I’ve ever created. It’s honestly a miracle that I was able to have a son as delightful and genuine as you.. The best part of fathering an angel like you is that I always see a part of me in you. You are my pride. Happy birthday..
Every great son deserves to be celebrated on the day he was born. Your birth was the beginning of happiness in my life as a mother. Happy birthday!. I may have been very harsh on you sometimes but it was all in the bid to make you the great son you have become. Wishing you success in all your pursuits in life. Happy birthday!. You continue to amaze me with your ability to spread kindness and generosity to everyone you meet. To be honest, I’m not sure where you got those qualities, but I am so thrilled you have them!. Do you believe in miracles? You are a perfect example of a miracle that happened to our lives. Wishing you more years of success, happiness and preparing. Happy birthday..
You were absolutely adorable as a child, you are utterly charming right now, and I have a feeling that you will be incredibly spectacular in the future. Happy birthday from the proudest parent in the world.. I may not always have a lot of free time in my life, but I will always make time for you. You are the most significant gift I have ever been given in life. Happy birthday, son!. You are my greatest treasure, my son, and I know I don’t tell you often enough how much you mean to me. That’s because it’s hard to sum up the feelings a parent has for their child, but I’m going to go with: I love you.. I hope that you always look ahead in life with a smile on your face and look back with fondness in your heart. I wish you endless joy in life on your birthday, and may it be filled with wonder and delight this year..
You are my greatest blessing, but you will also probably be my biggest downfall. This year I would love it if you could restrain yourself from causing too much trouble. If you can’t manage it then at least try to do it with some style!. It’s a fantastic feeling to have a son as excellent as you. Nothing brings me more joy than to be able to smother you with love, but the best feeling in the world is when you return that love..
You are more than my pride and joy; you are the reason I strive to be the best that I can be. I want to work hard and set a good example for you so that you are as proud of me as I am of you.. If you want success, you should never give up chasing your dreams. No matter how far they run, if you give them a good chase, you’ll definitely catch them. I wish you the best of luck in the pursuit of those beautiful dreams. Happy birthday..
One of the shortest things in the universe is life, so don’t wait until tomorrow to live it. Start living it right now! Happy anniversary.. Happy birthday my son I promise to sing extra loud just for you. You always manage to fill my heart with love and positivity. I wish I could be there on your birthday to give you a hug in person, but know that my thoughts are always with you..
Having a son as genuine as you makes my life complete. May your future be just as bright as you are, and may you experience nothing but happiness on your special day.. Being a parent is never an easy task, but loving a son as precious as you are is never difficult. You bring endless wonder and love into my life. Happy birthday my son!. Don’t worry about getting old, we will always treat you like a toddler to feel younger. Happy birthday.. I hope that you have a lot of fun this year on your birthday but not too much. I promise that you’ll want to be able to remember it at least when you’re older. Happy birthday!. No matter how old you get, know that you will always be my baby boy. You may not like it, but sometimes that’s the way the cookie crumbles. Happy birthday to my darling little boy.. I know you can’t wait to be the king of your own castle, but I hope you know that you’ll always be a little prince to me. May your birthday be filled boundless humor and joy..
Sending the most loving wishes to our phenomenal son this year. May your birthday be filled with good times spent with even better friends. Happy birthday, son!. There's something inside you that wants you to soar above the sky. Don’t shut down that thing. Nourish and nurture it and the sky shall be your starting point. Happy birthday..
On this day many years ago I had my greatest achievement: having a son like you. I would give you the world if I could, but this year you will just have to settle for this chocolate cake instead.. When you were born, you were a little bundle of our future hopes and dreams. Now that you’re older you’ve surpassed everything we could have ever hoped for. Happy birthday to our overachieving son!. My love for you has always been free, but it’s my pride and trust that you’ve really earned over the years. I am unbelievably proud of the young man you’ve turned into.. When you were little I was full of instructions for you: do this not that! Now that you’re older I have one more that’s really important: have a wonderful birthday!. I may have taught you how to be a good man, but you taught me how to be a great parent. Your expectations always made me try harder to be the kind of person you would be proud of.. I used to be the one training you to use the potty, but now you are the one training me to be a better parent. Just so you know I am completely fine with this reversal!. Time has flown by this year, and I look forward to spending so much more of it with my truly cherished son. May your birthday be filled with lots of treats and presents. Happy birthday!. 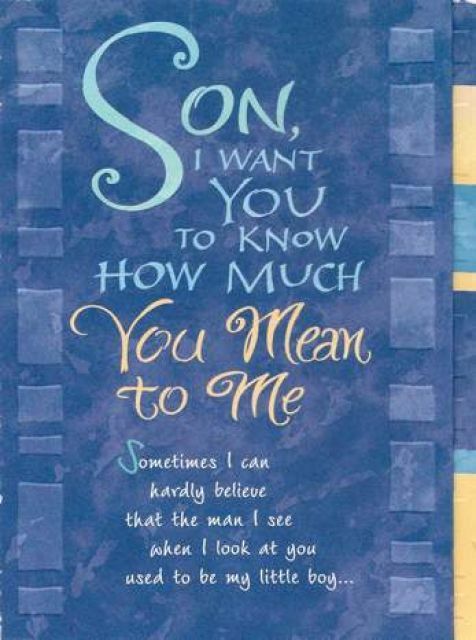 Son, I want you to know I love you so very much. You mean the absolute world to me, and I hope your deepest hopes and dreams come true this year. May your year be filled with endless magic and wonder.. Son, every year I see more and more of myself in you. I want you to know that I am equally sorry and proud of that fact! Happy birthday to my mini-me.. The higher the mountains in your path to success are, the grander your victories become. Always remember that. Happy birthday, son.. The more challenging your road to success is, the more magnificent your success becomes. Never be afraid to encounter challenges. Believe you can overcome them and you surely will. Happy birthday.. Your God-given gifts are extraordinary, and they are going to take you to great places in life. Happy birthday, son.. I might not be a fortune teller, but I know that your breakthrough is on the horizon. No matter how difficult the situation may get, don’t ever give in, for your success is at hand! Happy birthday, my beloved son..
You are my favorite son in the whole world. You also happen to be my only son, but all the more reason to spoil you rotten as much as I can. I hope you have a wonderful birthday filled with loads of compassion and love.. Happy birthday to you, son. Counting more years and less hair on your head. Have a great day ahead.. When you were born, I couldn’t even fathom how much you’d come to mean to me. You are my everything. May your special day be filled with untold splendor. Happy birthday!. Words cannot begin to express how awesome it is to have a son as amazing as you. If I had to try though I would go with: I love you more than life itself.. I can’t even comprehend how you went from being barely able to clutch my fingers to tightly holding my hand. Time has flown by so quickly over the years, but one thing will always remain constant: my limitless love for you. Happy birthday!. I am grateful every day that you came into my world. Your smiles and laughter are a balm to my heart. You have brought nothing but happiness into my life. Happy birthday, son!. Just like the candles on your cake glow, so will our love for you forever glow. There is no limit to the love we have for you – always remember that. Happy birthday to a special son..
To be a father isn’t an easy task, but thanks to you, the process was a breeze. You are a special kind of a son, and I shall forever remain proud of you. Happy birthday..
As parents, there are many things we wish for you in life: love, happiness, and wealth are just a few. I hope that you always remember to stay true to yourself and remember all that we’ve tried to teach you..
You may have given me some trouble when you were growing up, but that’s because the apple doesn’t fall too far from the tree. When I look at you now though I see a version of me that also happens to be more kind, honest, and hardworking. I am overjoyed that you have turned into the kind of man I am proud to call my son.. Son, you’re getting wiser every year, and soon you’ll be half as smart as me. This is a good thing because it’s really important to have goals in life!. Happy Birthday, Son. Have an awesome one!. We will never grow tired of loving you son, no matter what. All we ever want from you is to continue being who you are. Happy birthday to you.. Son, I may have taught you a lot of lessons in life, but you also taught me how to become a better person in life. Thank you. Happy birthday!. You have made my life more meaningful and poignant, my son. May your birthday be filled with lots of gifts, candies, and ice cream. Happy birthday!. You have enriched my life with your wit and humor, but nothing has warmed my heart as much as your kind and caring ways. I’m not sure how I had a son as wonderful you, but I am so glad I did..
Every year your birthday is a pleasant reminder of how happy we were when you were born. You have brought so much happiness into our lives, and we are eternally thankful. No parents could be more proud of their son than we are of you.. I know you probably think that my main mission in life is to ruin yours, but I promise that I only want the best for you. May you have unlimited successes and untold happiness this year..
As a parent, it’s my job to cherish all the special moments I get to share with you. Having a son as marvelous as you just makes it so easy. Happy birthday!. Today is my favorite of all the days of the year because I get to celebrate a champion of a son. Enjoy every bit of your day. Happy birthday.. If you never stop thinking positive, amazing things will never stop happening in your life. Happy birthday.. There are so many things I would like to give you for your birthday: balloons, toys, and cake are just a few. At the top of the list would have to be my limitless love.. Whenever you feel cold and alone in life, just call me, and my hugs will keep you warm. May you feel nothing but everlasting affection and endless support on your birthday..
You are undeniably a wonderful person, who will achieve great things in life. I’m so proud of you. Happy birthday!. Having a son as astounding as you has been one of the greatest delights of my life. You are everything a parent could hope for, and I wish you every success and gladness this year..
You bring everlasting light into my world. I hope always to be able to provide you with unlimited comfort and love. Happy birthday to my son who deserves that and so much more in life.. This birthday is the perfect reminder for you always to strive to climb every mountain set before you. Someone as dedicated as you can always do what they set their mind to. This year may you conquer every fear and win every battle.. I am so grateful that I have a son as splendid as you. You are my joy and inspiration in so many ways. I hope that this year you get everything you want from life..
With every passing day, you make me prouder to be your father/mother. Keep being positive, my dear, for a glorious life awaits you. I hope your anniversary is absolutely magical..
Don’t worry that just because you’re getting older, we won’t still get you gifts. This year we decided to get you a gift that revolved around money since you always seem to like those best: the gift of paying all your own bills. Happy birthday you grown up you!. I’m so proud to be the mother/father of a son who is more radiant than a million suns. Never stop shinning, my dear. Happy birthday..
As you journey through life, never ever be afraid of challenges because they are part and parcel of any road that leads to success. I wish you great luck and God’s guidance on all your exciting endeavors in life. Happy birthday..
As you celebrate this great day of yours, know that it is not just another anniversary, but another opportunity to bring all your dreams into reality. Happy birthday..
You will never be too old for hugs and kisses from your adoring parents on your birthday. Extremely embarrassed but never too old at least! We hope this year brings you nothing but happiness.. Happy birthday to the best ice cream buddy a mom could ask for. Congratulations on your birthday, son. May the good Lord help you to fulfill all the desires of your heart and fill your heart with immense happiness all the days of your beautiful life. Happy birthday.. I am still searching for a cake big enough to hold all your candles, son. But meanwhile, I wish you a ridiculously fabulous happy birthday, handsome..
On your birthday I wish that I could stop time. Not only to keep you with me forever but so that I can stop feeling so old! Happy birthday to my son who at least makes me feel young at heart.. I wish you a happy birthday followed by an even more joyous future. I know that you can achieve anything you want to in life because you are a genuinely phenomenal son.. Always live life to the fullest, because you never want to look back with regret in life. One thing I definitely don’t regret is having a son as wonderful as you. Happy birthday!. 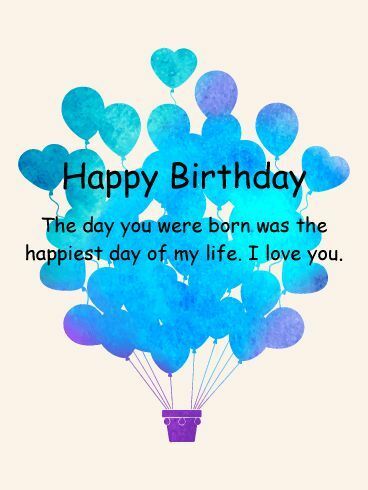 This year for your birthday I would like it if you would blow out your candles, cut your cake, and be bathed in your parents’ love and adoration! May your birthday be full of splendor and joy.. I am the happiest person in the world because I have a son as wonderful as you. I wish you the very best until the end of your days. May everything you wish to accomplish come to pass..
We have never stopped thanking our stars for coming into our world. You are the reason life so meaningful. Happy birthday sweet heart..
You always know how to bring sunshine into my life and laughter into my heart. You will always be my bundle of joy, but I’ll try hard to treat you as the man you’ve become.. I always wanted to be an example to you, son. Little did I know that you would one day become an example to me. Happy birthday.. This year you seem to be exhibiting some signs of actually growing up. It’s a miracle! I’m just kidding, and I hope that your year is filled with all sorts of splendidly childish things that captivate you in every way..
Today is your birthday son, and come what may, you shall support wildlife by having a super wild party.. This year I want you to know that my world is better with you in it. I could never have known how wonderful it would be to be a parent. A son like you is what every parent dreams of.. It has been a wonderful experience mothering an adorable son like you. Thank you for being such an amazing blessing to me. Happy birthday..
You have made fatherhood the best experience of my life. I am truly blessed to have a son like you who enriches my life with his endless love and affection. I hope you know that you are truly treasured..
No matter how many birthdays come and go, you’ll forever be my pride and joy. No other could ever take your place in my heart. You bring me everlasting joy and affection. Happy birthday to the apple of my eye.. Even when you are too old for a room in our house, there will always be room for you in our hearts. You will never be too old for our love and support. Happy birthday to our outstanding son!. Your presence is what livens up my life, son. Thank you for filling my life with lots of adventure and fun. Happy birthday and have a great one..
May your birthday remain forever in your heart as you do in mine. A son as precious and wonderful as you is a true gift in life. Happy birthday to the world’s greatest son!. You deserve many things in life: endless attention, constant pampering, and unlimited support are just a few. This year on your birthday I plan on providing you with the most important one of all: never-ending love.. Happy birthday to the best ice cream buddy a dad could ask for. You may be a father now too, but you will always be my baby boy in my heart. I am so glad that now you also get to experience incredible joy and worry as I did. Happy birthday, son!. Today is your big day, and I hope it is filled with awe and grandeur. I think the world of you, and I want your birthday to be as perfect as you are..
You fill my day with lots of happy moments and incredibly precious memories. I look back on my time with you with nothing but absolute satisfaction and delight. Happy birthday, son!. You are every father’s dream, a son so charming, caring and captivating. You will forever remain my favorite boy. Happy birthday.. Your hugs give me the will to keep going when I’m down and out. Thanks for being such a comfort in my life. If you are ever struggling just come to me, and I will always be glad to return the favor.. If all children were like you, this world would be full of happy parents. You are our bundle of joy. Thank you for making us the happiest parents on this planet. Happy birthday.. Son, you might not have reached there yet, but I know that you are definitely going to get there and make it big! I’ll be right behind all the way. Happy birthday!. I always dreamed of becoming a good father, and now I’m even a better one. Thank you for bringing the best out f me. Happy birthday!. I hope you know that I will always love you no matter what the future holds. Even if you crush all my hopes and dreams like you crushed my car, I will still love you. I might just love you a little less though. Just kidding!. When you were conceived, I couldn’t imagine how on earth I would manage being a parent. Now I can’t imagine not being one. It’s all because I have a son as remarkable as you.. When you were a baby, you screamed at me, when you were a teen you hardly spoke, but now that you’re a grown man your words are so very priceless to me. Here are some words for your birthday that I sincerely mean: I love you.. I remember when you were little I used to be your role model. I don’t know when or how it happened, but now you’re mine. Thank you for always being the kind of man I could look up to..
You are an extraordinary son and a wonderful man. May your birthday be as sweet as the joy you bring everyone. Happy birthday, son!. You are one of the most beautiful things to ever happen to me, and I am so grateful that I am blessed with you in my life. May every dream you have be fulfilled this year..
My son, you are a perfect example of everything that has gone right in my life. May your birthday be filled with an explosion of fun, laughter, and presents..
My joy in having you as my son is something that can’t be measured. It can only be felt through lots of hugs, kisses, and adoration. I’m so happy I was blessed with a son as astounding as you..
My love for you is far greater than my heart could possibly hold. I am so grateful that I have such a wonderful son and that you always manage to make me look like a good parent!. The most precious thing in our lives is you, son. And you shall forever be. Enjoy your Big Day to the max with the knowledge that we shall forever love and cherish you.. Thank you for giving me the chance to experience fatherhood. Wishing you all the good fortunes you deserve in life. Happy birthday to you, dear son..
You are a beloved son and a cherished father. I know that you are as proud of your son as I am of mine. Try to make sure that you keep the family tradition of pampering your son on his birthday alive in the years to come.. Happy birthday just isn’t enough to express how great I hope your special day is. I wish I could infuse your day with all the warmth, love, and affection I have for you. May your day be as magnificent as you are son..
Know that whatever you choose to do in life I will forever be proud of you. I am especially proud this year on your birthday that you are becoming a smart, kind, and thoughtful young man.. I thought I had the perfect life and then you came along. Then I realized I had no idea what perfect was until I was blessed with a son as beautiful as you.. There have been many times in life where you have brought me so much worry and angst, but you have also brought me so much joy. I would still love it if this year if you could try and stay out of trouble though!. I hope that all your future birthdays are just as memorable as you are, my son. They should be because your loving parents intend on being there for every single one of them..
Know that no matter what happens in life I will always be there to cheer you on and support you. There is no endeavor that you could undertake that I wouldn’t be proud of.. When times are tough, all it takes are thoughts of you to pull me through. Your hugs and kisses nourish my soul, and I’m so grateful that I have a son as precious as you.. I hope that this year your birthday is just the beginning of an unforgettable journey that will lead you to an even more amazing future. Remember always to continue to wish and dream..
Raising a son like you has been the most beautiful thing in my life. My love for you is endless. Happy birthday, my prince. You will always be my world.. I hope all your tomorrows will be filled with everything good life has to offer because having a son as wonderful and charming as you has enriched my life in so many ways.. I hope you face the world with positivity and courage, my son. May everything you want in life come to you this year. Happy birthday!. Thank you for stealing my heart the day you were born. May your special day be filled with light, laughter, and unending joy this year. Happy birthday, son!. Happy birthday to my hero. Know that I am your number one fan, and I can’t wait to see all your dreams come true. Wishing you a great year ahead. Happy birthday..
Hope you like my collection of Birthday Wishes For Son. Pls, share them with others too.